Even when you manage to figure out the best ways to group your students, there is always the matter of encouraging them to talk. There are a number of factors that contribute to the ways students work and talk in groups and in the classroom. 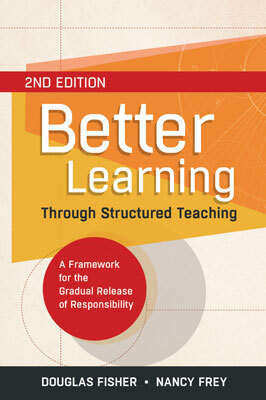 Fisher and Frey write in Better Learning Through Structured Teaching (2013) that there are five features of cooperative learning: 1) Positive interdependence; 2) Face-to-face interaction; 3) Individual and group accountability; 4) Interpersonal and small-group skills; and 5) Group processing (p. 69-70). They go on to point out some of the distinctions between collaborative groups and cooperative groups, finer points that I think most teachers don't know or overlook as they focusing on grouping and helping their kids find ways to learn. I think most teachers tend to use the terms synonymously because the finer points are just too fine. For those of you curious to know, one point is that collaborative grouping does not "insist on face-to-face interaction" (Fisher & Frey, 2013, p. 70). The other is that collaborative grouping expects academic language. I think the first point is less valid with blended, flipped, and tipped learning; I think the second point is irrelevant because I think students should use academic language. Period. Moving on. The upshot for most students is that grouping might mean that some students do less than their fair share of work. How do you fix that? First, establish norms for group work. Even better, have your students establish norms for group work. You can revisit the norms periodically, especially as you determine if what ways your students' group behavior changes. I've been in some classrooms in which groups are allowed to "fire" a group member for not working with the group, and the classroom norms were that that student then had to work alone. That might be extreme for some teachers and some classes, but you have to make decisions about what works for your classroom and the students with whom you are working. 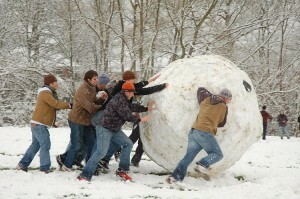 And keep in mind you might need slightly or somewhat different strategies next year with a whole new group of students. 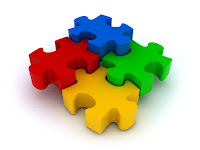 Second, make sure group work make sense for the task or for parts of the task. Third, make sure the way you group students make sense for the task or the part of the task. Perhaps you'll have them work in pairs, then in threes, then back to pairs, then whole group. Just do what makes sense, as my friend Molly Funk likes to say. Fourth, have a selection of strategies you can use to mix up the group work and the accountable talk work. Let's talk about strategies now. I'm going to offer a few that may be familiar to you. In another post, I'll share some others. I know a lot of teachers who already use this strategy. Basically you arrange students in groups. The size of the group is dependent on your class, but, as a general rule, no group is larger than 4. Each group member gets his or her own part of the task: paragraph to read, an article to read, a video to review, a web site to examine, listen to a podcast. Keep this in mind but it almost demands that you have a four-part task; however, there are ways to manage the task distribution when you end up with irregular groups. Then group members with like task parts get together to do the reading, listening, viewing, etc. and, as assigned, share ideas, do additional research, etc. They become a group of experts on that part of the task. You should facilitate those conversations to try to be sure they don't wander off task and/or they don't follow something that's confusing or inaccurate. Then they return to their original groups to share the collective learning of their group of experts. For more information, you can go here. 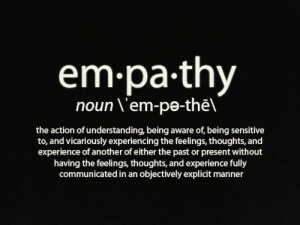 This is one of my favorites and it can be used a number of ways. I've seen it used for synthesis as well as summary; I've also seen it used for a fun creative writing activity. In fact, I've used it for the latter. There are a few ways to do this. You can provide students with sentence starter options or one sentence starter, or you can let students come up with their own starting sentence. The first time you use writearound, I recommend giving students sentence starters so they don't lose time coming up with that introduction. Now your students can be in groups or, depending on the size of your class and/or how much time you want to allocate, you can do this whole group. And you can have students write a sentence at a time or you can use a timed version. Again, the first time you do this--depending on the grade range and capabilities of your students--you might have them write at least one sentence without a time limit. Let's say you have your students in groups and decide to use a time limit. You give students time to review and think about the sentence starter(s). When you say "Go," each student selects a sentence starter--or you can have them all use the same sentence starter--and start writing. Give them one or two minutes, whatever makes the most sense for your grade level. You want to make sure the students who are processors have time to process. Then have students pass their papers to the right. They read the paper they received and then start adding to their classmate's work. If you started with one minute, you should allow at least two minutes for the second round to give students time to read, process, and write at least one sentence. This isn't about quantity and no one should be penalized for writing only one sentence. When you call time, students pass their papers again to read, process, and write at least one sentence. You can do as many rounds as you like, but watch for student restlessness. They may get bored with too many rounds. You should announce the last round so the last students know they need to try to wrap up. You might want to allow a bit more time for the last round. Students can compare their stories and their works, why they took the approach they did, what they liked best, which one they want to use to represent their group. The nice thing about choosing one to represent their group is that everyone should have contributed to it. 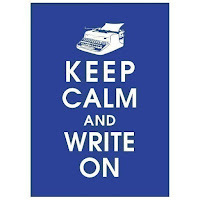 Before you start the writearound, you should decide if spelling and grammar matter for this draft writing experience. If not, then part of what the group can do for their selected final version is edit it to make sure grammar and mechanics are correct. You can use this strategy for nearly every content area, and you can see there are plenty of opportunities for a range of collaborative and cooperative skills in reading, writing, and communication as well as the refinement of knowledge and understanding of the content area. I've seen many variations of this strategy, but the fundamentals are straightforward. Students begin in groups of no more than 4. You pose a task or question. The students work together to determine the answer. You allow them however much time depending on the complexity of the task and if they have to do any research in their print or digital texts or elsewhere. When you call time, you can then call a number and each student with that number in his or her group stands up. Each student with that number answers the question. Or, you can give students a task or pose a question. Perhaps you've asked them to do some reading, view or listen to something, etc. they might discuss in general in their groups. Then you pose a question that is sufficiently high level that students have to engage in critical thinking and listening as they determine how they might answer that question. You should circulate around the room to listen to discussions. They don't have to agree with their colleagues though you may want some consensus. It all depends on the learning targets and why you are using this strategy. For most teachers it is to get students to engage in rich conversation, but also to learn how to support their thinking with evidence. When you call time, you call a number and each student with that number stands up. In this variation, the students don't know what question you might ask. You should have some questions prepared and then select your question based on the conversations you've heard as you circulated around the room. This is where it can get really interesting. Let's say you call on all of the 2s to stand up. One of the 2s gives a great answer; you call on one or two other of the 2s for their responses as well. You don't have to have every 2 answer the question. Then you ask the 3s to stand up and ask them to paraphrase what they've just heard. As you listen carefully to their responses, you ask them to sit and then ask the 1s to stand up. You ask them a follow-up question to the original question or a completely different question. Then before you go to the 4s, maybe you go back to the 2s or 3s to ask them to share any synthesis between prior answers and this one. The order of the numbers should be random so make sure you don't fall into a pattern but you also need to be sure you try to get all members of the groups participating. On the other hand, it's okay if you don't have all members of every group speaking every time. You can also offer your students a couple of lifelines. One lifeline is to confer with their groups for some set time before offering an answer. Keep that time short: no more than 30 seconds. Another lifeline is to pass on the answer but each group can have only one pass for the whole activity--not per round--so they must be judicious. I have seen this strategy used in upper elementary school as well as middle and high school. I've seen simpler variations used in primary grades when the task and the answers are more direct and the evidence much simpler to provide. But don't be surprised if even your younger students give you some unexpectedly profound answers because this can really get them thinking! These are a few strategies you might implement in your classroom, though you might already use some variation of these. If so, I hope you share your versions and the content area and grade levels in which they've been successful! You can find a podcast of this post at https://soundcloud.com/teaching-revolution. 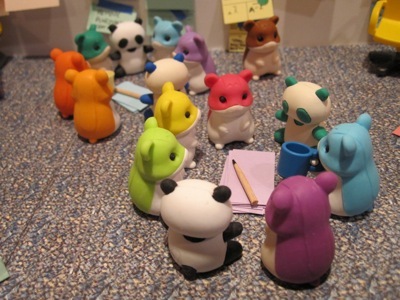 In the world of K-12 education, we have popularized the importance of grouping students. In the early 1970s, educators began organizing their students and structuring their teaching to accommodate collaborative groups and cooperative learning. Cooperative learning could expose students to other points of view and, of course, help them learn how to cooperate. We know that many students do not how to cooperate or simply are not inclined to cooperate. We have plenty of students who prefer to work alone for a number of reasons and yet, we insist on forcing our students into so-called teams. What we often don’t do is make sure our students know how to listen to each other. We also rarely teach them how to analyze and synthesize what they are hearing, how to ask questions, how to monitor their behavior, etc. One of the many challenges for teachers is knowing how to group their students. There is no shortage of research and books on grouping students, but what’s interesting to note is how often the focus is on classroom management as well as student learning. I’m not saying we should integrate collaborative groups and cooperative learning in our classrooms. But as with any other strategy, I think we need to be mindful of why we are grouping our students. Not too long ago I was in a classroom in which the students were in pods of three, so three desks were clustered together. When I asked the teacher how she determined which students should be together, she had no real response. Another teacher has his 9th grade students in groups as well, the desk organized in groups of four. He has rearranged his students in their groups to try to find the best mix of personalities and learning styles. So it’s not the “low” reader with the “high” reader, but kids who might actually collaborate and cooperate in their learning. He told me he tries to mix up the groups periodically because he thinks there is some advantage to the students to learn how to work with those who are less like themselves. This teacher has some constraints based on the size of his classroom but he said he toys around with the sizes of the groups periodically as well. I’ve been thinking about this because I’m often asked about strategies to group students and this teacher grasped what I’ve been saying for years: the grouping is about and for the students. If the students are in groups that make sense to them, classroom management may be less of an issue. Those collaborative strategies can then draw from any students in the classroom at any time because the collaborative structure is not limited by strict grouping parameters. We should remember too that while we might make fun of think/pair/share as a potentially overused strategy, Kylene Beers and Mike Schmoker both assert that students working in pairs can be effective for short periods of time, especially when used to promote understanding. Think about how noisy a classroom can get when kids are working together—and let’s assume those groups of 3 or 4 are on task. As the volume in the room increases, the kids counter not being able to hear by talking even louder. But if you put your students in pairs, they can and will work more quietly and may work more efficiently because there is nowhere to hide—they have to listen to each other. Of course, design task comes into play, but that’s a different conversation. And if you have your students sharing technology, it is more likely that both can and will be participative because not only can they hear and be heard, but they both can see and they both can touch. Students can learn cooperatively and they can learn to collaborate. 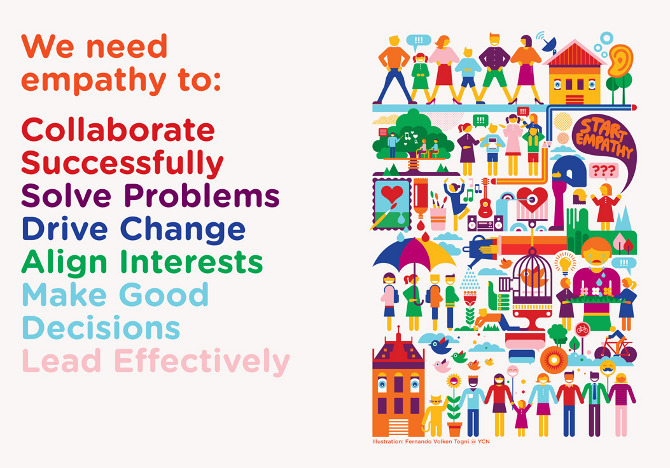 Using pairs at the beginning of the school year and then occasionally throughout the school year enables students to practice a number of communication and learning skills, but also helps them discover and practice their voices for learning. 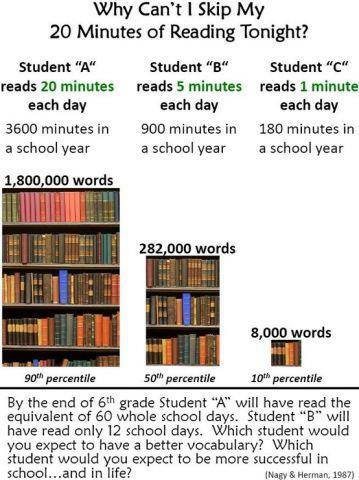 Scholastic Parents shared this graphic. I'm going to ignore the percentiles for the moment and the number of school days to focus on the number of words: the kind of vocabulary development that could happen if a student reads 20 minutes a day or 3,600 minutes a school year. Nearly 2 million words. Of course there are some assumptions that must tag along with that--that kids are reading a range of books and some of those books might be above grade level. But it's not just the vocabulary development that's so compelling. Absolutely that's important, but something else happens when we read. In June 2015 Buzzfeed published "26 Reasons Why You Need to Read More" (and the editor in me would say they could have excluded the "why," but I quibble). They asked attendees at a conference to share their reasons for reading. Pretty cool. One of my favorite reasons is "Because books tell the stories of people we don't know, places we haven't been, and worlds we can only imagine." Another favorite reason is "Reading stimulates the mind in a way that movies and TV cannot; reading awakens a dormant imagination and keeps the mind fresh." Along the same lines is this reason: ". . .the knowledge alone that's written in books is worth any time invested in reading, and also the adventure and journey that they take you on is priceless." 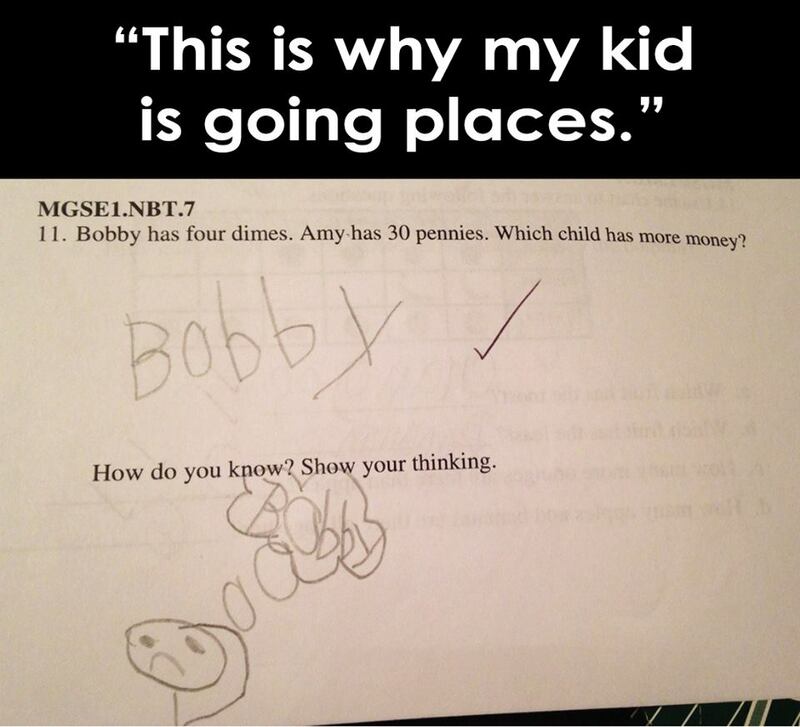 The "show your thinking" image has made its way around the internet and will likely continue to have some visibility. 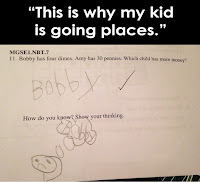 It made me laugh because I LOVED the way the student interpreted "show your thinking." In my opinion, the student interpreted the statement correctly. He was asked to show his thinking. 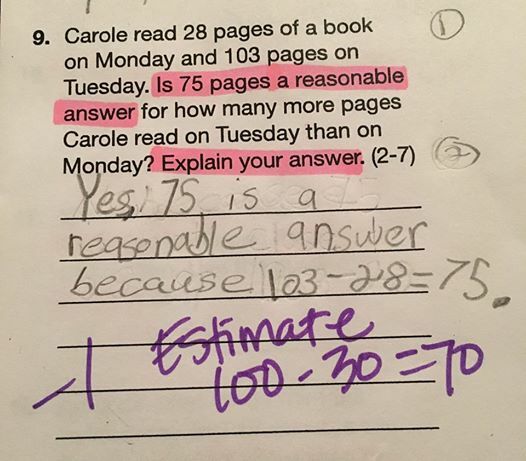 Now we know the teacher meant for the student to show how he worked out the answer to the problem; "show your thinking" has become today's version of "show your work." I'd give the kid style points and then rewrite my questions so they make more sense to my students. Around the same time I saw the "show your thinking" image, I saw (and reposted) the creativity graphic. I've seen a couple of versions and this one may not be the most "creative," though I do like the old-fashioned typewriter look and feel. What's important to me are the words. Because I think kids who read, and who read for pleasure as well as school, tend to be more creative people. 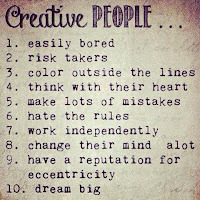 I also think that we have some really curious views of what it means to be creative. I think about some of my former students and the kinds of things they do with their families and for themselves that bring them pleasure: bake, sew, write and/or play music, etc. Yes, that's creativity. But creativity isn't just about "the arts." Creativity, in my opinion, is how we approach situations or problems that need some sort of resolution. I have a friend who is a programmer. Every time she has to solve a problem or fix something in the system for which she is responsible, she has to exercise some level of creativity to see the options to the solution. We don't always think about science, math, or engineering as "creative," but take another look at a bridge, or the engineering behind an artificial limb or some of the dozens of things we use on a day-to-day basis that seem to be mundane but are really quite. . .creative. We use the word "innovation" a lot. Where does innovation come from? Doesn't it come from creative thinking? David Hill reminds us of Sir Ken Robinson's TED Talk on schools and creativity. Hill quotes Robinson: "Human resources are like natural resources; they're often buried deep. You have to go looking for them, they're not just lying around on the surface. You have to create the circumstances where they show themselves." I think about the stories of the history of inventions: the accidental discovery of Post-It notes; Grace Murray Hopper's work that led to COBOL; and a whole long list of inventions by women that aren't just for women. Creativity isn't just about "the arts" or inventions, though. We see creativity every time a kid makes up a new game, every time someone in an office figures out an improvement to an existing process or policy, every time someone chooses to think differently. 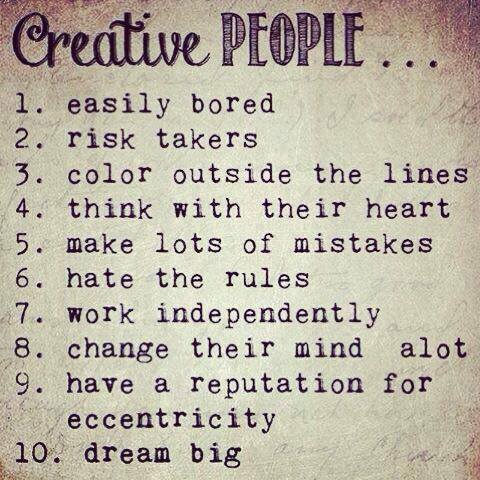 I don't believe that all 10 of those signs of creativity are in play all of the time. Plenty of us abide by rules but are still creativity within certain spheres of influence. Some of us are creativity and don't take a lot of risks and our creativity is informed by the need to reduce risk. 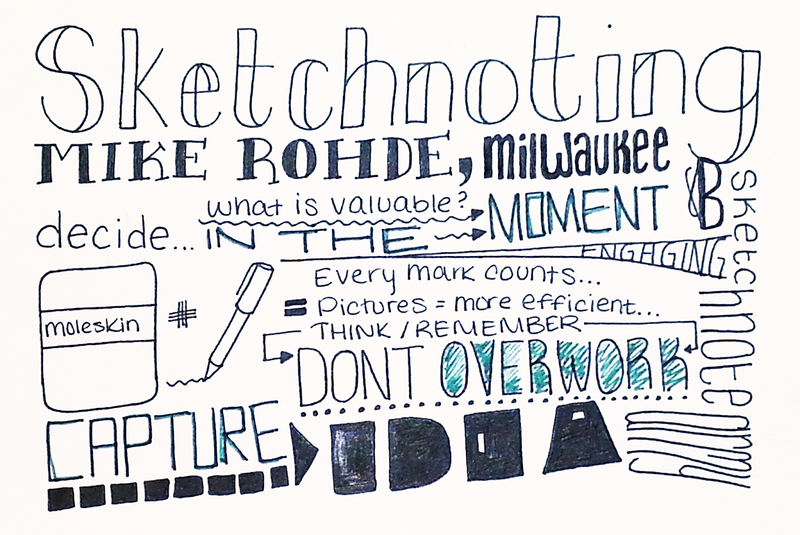 Recently I've heard increasing buzz about sketchnoting. 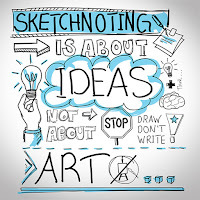 Sketchnoting isn't new but it's just now beginning to attract some attention. Some people think it's just doodling, which it kind of is, but it's doodling with a purpose and with some semblance of organization. Sketchnoting provides students with a mechanism to meld words and visual thinking. Sure, the graphic to the right says "Draw, don't write" but the beauty of sketchnoting is that it is about the ideas and visible thinking. It is about thinking creatively and making connections. Sketchnoting appeals to those who are easily bored (1), who like to take risks (2), who prefer to color without too many lines (3), etc. So what does sketchnoting and thinking about creativity have to do with how many words a kid might read in a school day? That's a good question, though not the only question. Let's set aside sketchnoting for the moment. The more I read, the richer and stronger my vocabulary. The more I read, yes, the more I know and the better able I am to make connections between that which might not seem obviously connected. My critical thinking skills for analysis and synthesis will get stronger as I read more and read more diversely. The more I read the more I know to determine what is most likely true or appropriate; the more I read, the more information I have to make better informed decisions and insights. The more I read, the more likely I am to see things--literally and figuratively--differently and if I use sketchnoting to document my thinking and the way I analyze and synthesize what I hear and read, the more likely I am to get bigger ideas on paper and the more likely I am not to lose some of the details because I don't have to find words right away, I can sketchnote what I'm thinking that will help me see it again later, perhaps see it differently and more clearly later. 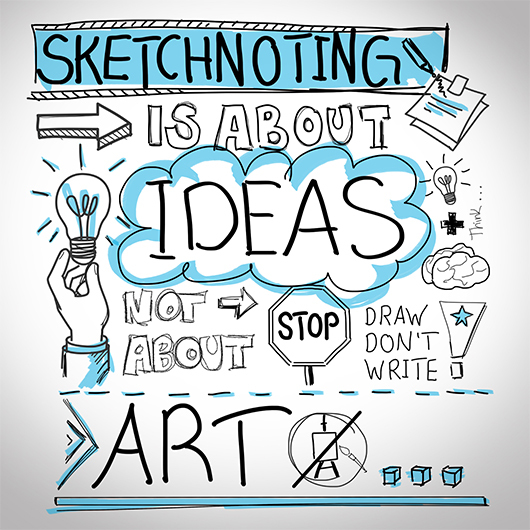 Yes, sketchnoting could be a great tool for students who are learning the language and that means that there is a powerful link between word and image--though we've always known that--and that how a student chooses to show his or her thinking offers great insight for the student, the parents, and the teacher. Authors, poets, songwriters, playwrights, and screenwriters remind us of the power of words. Each time we read a text we can be reminded of their power and what they ignite or inspire within us. Even so, we talk about reading as though it's not very creative though so much of what we read insists we use our imaginations. We talk about reading textbooks and learning as though reading textbooks and learning are somehow mutually exclusive from creativity. . . and yet every time a reader makes a connection, there is a spark of creativity and who knows what could grow from that? Content knowledge collides with Common Core. Again. We have more "Common Core" math problems making the rounds. As is so often the case, the problems aren't Common Core math problems but badly written math problems, or badly assessed math problems, and probably by a math teacher who is trying to implement Common Core standards but really doesn't know how for any one of a zillion or so reasons. This is one of the math problems making the rounds. The question asks a student if a number of pages of reading is reasonable. The question is marked wrong because the student did not estimate but there is nothing in the question asking the student to estimate. What's worse, it's asking a dumb question. On what grounds is a student to determine if 75 more pages is reasonable. She read them. It's past tense. How is this a reasonable question? I'm less annoyed, well, aggravated by the answer being marked wrong than the quality of the question. I think the student answered the question as asked to the best of the student's ability. It's not the kid's fault the question is a bad one. Now I'm guessing a teacher was trying to align the question to a standard relating to estimation. 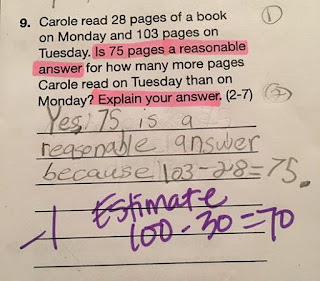 I think estimation can be a tough skill for kids to learn and this question, perhaps written because of a teacher's anxiety to test standards-based skills, doesn't help the teacher measure that at all. The problem with the problem to the right is one that really irks me. My interpretation, based on only the document, is that the teacher taught students how to group a particular way and was looking for that answer. Is 5+5+5 the same as 3+3+3+3+3? By my math, yes. Is the answer wrong? No. The teacher offered no rationale for the "correct" response though it's possible that was discussed in class when the results were returned. As noted in the article about "insane math problems,"
While both topics, estimation and repeated addition, are part of the Common Core standards, Common Core does not have a standardized way teachers are supposed to teach them. A lot of teachers and administrators know that the Common Core standards provide guidelines for what students need to know and able to do. There are no activities, no teaching strategies. The Common Core is not a curriculum, it's a set of standards student are expected to meet to help close achievement gaps and prepare them for college and the workforce. . .The way the teachers put in place curriculum and meet those standards is entirely their own. When I worked for Pearson Education Teacher Education & Development Group and for ETA Hand2Mind, I had conversations with principals and with math teachers who were pleading for help to learn how to teach and assess math well. Pearson was before Common Core and ETA Hand2Mind during the heady first few years of it. But I also recall teaching Basic Math at the collegiate level and having students who struggled with fundamental math skills, notably in fractions with corollary challenges with decimals and percents. Based on work I've done with teachers and administrators since then, those challenges remain. Too many teachers who are responsible for teaching basic math skills are not that adept at math themselves and rely on ready-made lesson plans and assessments. If a kid answers a question in an unexpected way, the teacher hasn't sufficient content knowledge to be confident if the answer is correct or not, and why or why not. I don't think the problem is Common Core. I think part of the problem is Common Core implementation but I think a substantial part of the problem remains with math content knowledge of teachers and their limited repertoire of teaching strategies. I know there are lots of ways to remedy the situation but teachers need to be permitted to acknowledge their content knowledge limitations without fear of repercussion and they need to get the administrative supports they need to develop their own content knowledge and skills, and they need to have alternative options to help their students in the mean time. Good morning, class. My name is Dr. Roberts and this is ENG101: Expository Writing. We'll spend some time reviewing the syllabus to make sure you understand my expectations for this class. Please note that the syllabus can be considered a contract between me and you. You have a responsibility to read it and refer to it as it contains most of the information you need. You will write more than one draft for most of your papers. You will write several short papers, about 3 to 5 pages, and you will write at least two longer papers, about 7 to 10 pages. [A hand is raised with evident reluctance.] We'll write all of those papers this semester? and I figured it out. Reasonably well that first time and increasingly better over time as I realized I had to meet my students where they were and pull them to improvement. That was often like convincing your cat to take a bath. Sure there are some cats that don't mind a bath or will go along with it to get it over with, but most, not so much. Those first diagnostic essays were often excruciating. I learned to give my students prompts so they could write about something that interested them. I found and developed activities that could mimic experiences they would find in other classes as well as the kind of writing they would do in the so-called "real world." I had my students do activities that would challenge them to think about word choice and sentence structure. I bantered and badgered to remind them to think about the audience and quite often they wrote not for me but for an imagined audience: their best friend, a boss or a future boss, a grandparent, someone from their church or community, etc. I learned that some of my students were incredibly insightful and creative but many of them were stuck in 5-paragraph loops because of the way they had been "taught" to write. They had no idea how to identify the main idea of a paragraph let alone the theme of an entire text. They didn't know how to summarize nor were they able to analyze. My colleagues in other departments claimed I and my other ENG colleagues weren't teaching kids how to write. . . for business, for science, for whatever. So my writing colleagues had a workshop in which we asked our business, science, education, and other faculty colleagues to work in their table teams of mixed disciplines to come up with their top seven peeves. That was enlightening. For all of us. Then we had them assess a collection of freshman writing papers. We used a topic that was fairly broad and asked them to score it using a 6-point scale. Then we compared results and the rationale each faculty member used. The discussions were fascinated as they discovered each was looking for something different in a paper. It took them a long while to understand that they had some responsibility for teaching domain-specific elements of writing in their classes. They began to realize we have only 15 weeks--and really closer to only 10 weeks--in ENG101 to repair some damage, help students unlearn bad habits and bad practices and begin to learn better habits and practices. That's a lot. As department chair I organized a symposium. It wasn't as well attended as I hoped, but the insights were sufficient in that local principals and teachers came to talk with the freshman writing faculty about their challenges in teaching middle and high school kids how to write. The diversity of the community represented was important and the writing faculty got quite an education in understanding why middle and high school teachers struggled to help kids learn how to write more than a 5-paragraph essay. Now that college was not a selective school but I was also an adjunct at a very selective school. Most of those students were in the top 10% of their classes and had never had a grade below an A. Imagine their shock and alarm when they got a C on a freshman writing paper. Why? How? Well, not all high schools are equal and what might constitute an A at one school might not have been an A elsewhere. And, well, this is college. So some of those kids had similar bad habits though, in general, they had the fundamentals and better vocabularies. There are several components, I think, to the problem of teaching writing in school. First, most teachers have no idea how to teach writing. Check out most education programs and look closely for that writing methods course. Yep, good luck with that. The NCTE has a position on the teaching of writing, but that has made much difference in teacher education curricula. Reading methods? Check. Math methods? Check. For secondary education English majors, literature content? Check. Writing? Anyone? Could it be integrated somewhere else? Actually, I think it could be integrated in a lot of methods courses except there is already so much for students to learn in their methods courses. Writing is something that tends to be overlooked. My theory is that teaching writing is associated with teaching grammar and teaching grammar makes people cringe. But there is also the math. Let's say you're a high school teacher and have 6 classes of students a day. Let's say you have a manageable 20 students in each class. That's 120 papers to grade. Let's say it takes about 45 minutes to grade each paper: that's taking the time to skim, then read more carefully and make marginal notes so the student can improve his or her writing and, perhaps, write an improved draft. That's 5,400 minutes or 90 hours. And let's say I stagger my assignments so I don't get 120 papers in one day. That's still 45 minutes times 20 students (45 * 20 = 900) which is 15 hours (900 / 60 = 15). And let's acknowledge that having only 20 students in a class would be a gift. So universities have writing centers and writing tutors, which may or may not be helpful but is better than nothing. 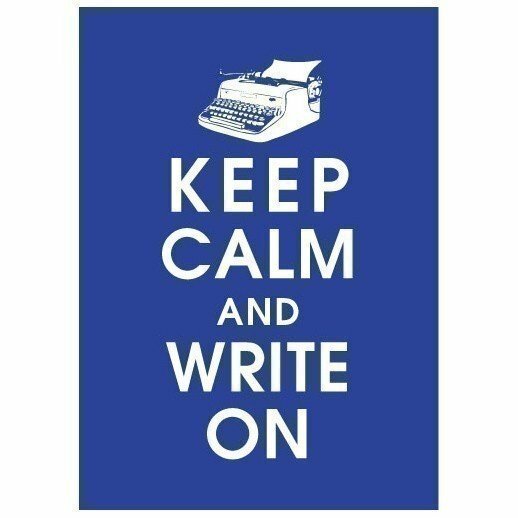 I always recommend that students who struggle with writing get to the writing center ASAP and/or find a writing tutor along with their math or science or whatever tutor. There is no shame in finding a tutor; it is, I think, a significant quality of character to admit when and where help is needed. But I also think that teachers confuse quantity with quality. Writing more papers is not a reasonable approach. Writing fewer papers well is a better idea, but that's a different post. Teaching writing is not for the faint-hearted but, as a former college writing teacher (who would do it again in a heartbeat), watching kids blossom, discovering their voices and their strengths and learning to manage their weaknesses. Yea, that's amazing.